This morning we went to a local carboot sale and indoor market where I got a great deal on a dvd box set and we bought a side board / cabinet for our bedroom. We’re going bowling and for food with some friends this evening so wanted a quick and easy meal for lunch. 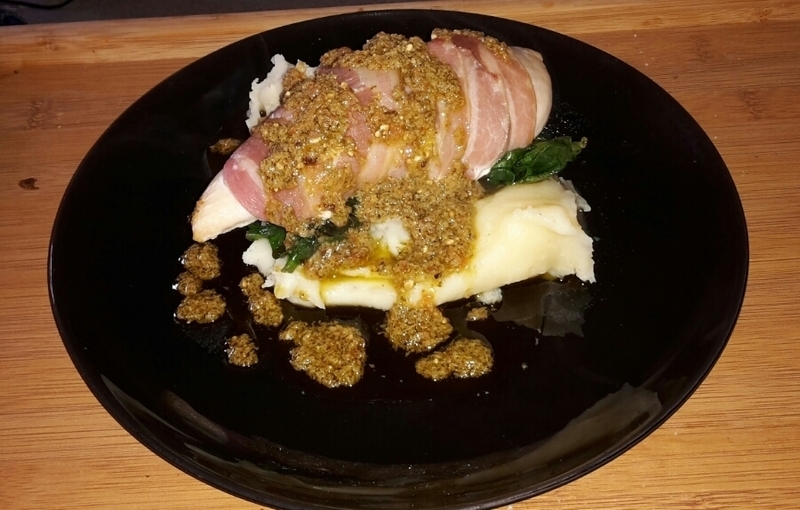 We decided on a chicken dish and this is what we came up with – chicken wrapped in bacon which we served with mash, spinach and pesto. It was lovely! Definitely adding it to our go to meal list. Wrap the chicken with bacon until completely covered, 2 rashers should do. Roast in the oven for approximately 30 minutes until the bacon and chicken are cooked through. Meanwhile, prepare the mash potato and spinach. Serve the mash topped with the spinach and add the chicken on top then drizzle with the pesto.